LOS ANGELES, April 20 (Reuters) - A federal judge on Friday signaled possible shortcomings in a request by Donald Trump's personal lawyer to delay adult-film actress Stormy Daniels' lawsuit over her alleged affair with the U.S. president, but stopped short of putting it on hold. Daniels, whose real name is Stephanie Clifford, sued last month to end a non-disclosure agreement related to a $130,000 payment she received from the lawyer, Michael Cohen, before the 2016 U.S. presidential election, to keep quiet about her alleged relationship with Trump a decade earlier. At a hearing in Los Angeles federal court, U.S. District Judge James Otero said he needed more time to review Cohen's and Trump's request to put Daniels' case on hold for 90 days. But the judge told Cohen's lawyer Brent Blakely that "there's some gaping holes" in the request for a stay. That request followed the FBI's April 9 raids of Cohen's home, office and a hotel room, and seizure of several boxes of documents and electronic media on various subjects. Federal prosecutors have been conducting a criminal probe of Cohen's business affairs, and lawyers for Trump and Cohen have said Daniels' civil lawsuit overlaps it. They said letting her case proceed could both impair Cohen's constitutional right under the Fifth Amendment against self-incrimination, and make it harder for Trump to defend himself. During Friday's hearing, Daniels' lawyer Michael Avenatti complained that Cohen presumably "knows where a lot of bodies are buried," and that the defense strategy has left his client "in a room of darkness" in a case of "critical importance" to the public. Blakely countered by estimating that Avenatti has made 53 public appearances discussing Daniels' case. "Quite frankly, I can't think of any situation they haven't talked," he said, drawing courtroom laughter. Although Blakely suggested a 40-day stay might suffice, Otero said both sides remained far apart. "We're almost like two ships passing in the night," he said. The judge did not indicate when he will rule. Daniels has said the non-disclosure agreement was void because Trump did not sign it, and that Cohen defamed her by insinuating publicly that she lied about having an intimate relationship with Trump. Trump and Cohen have sought to force arbitration, where new details about Daniels' case would be shielded from the public. After the hearing ended, Avenatti told reporters he was pleased with how it went. 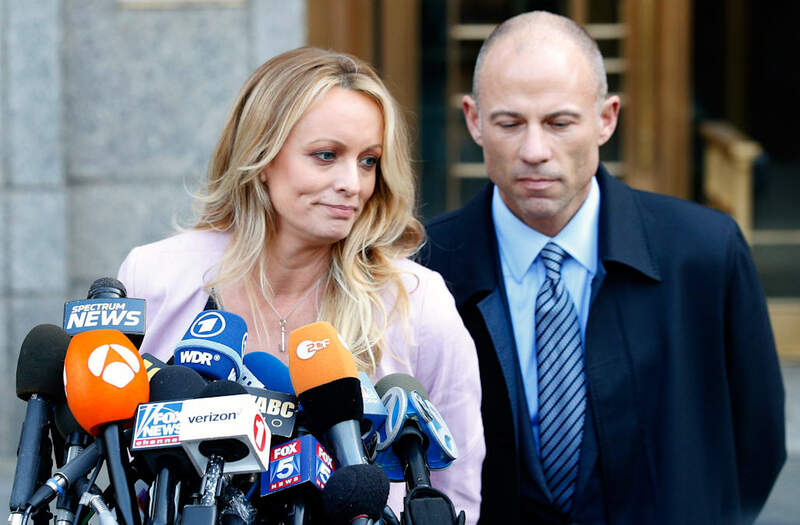 "I very much look forward to placing Trump on the stand," Avenatti added.